Every day, CPG products make their way to the country’s largest retailers. Goods from different manufacturers shipping to the exact same destinations, but all following their own line of supply. This redundancy inflates costs, blocks our roads, and pollutes our air. We need an alternate model for CPG product distribution. 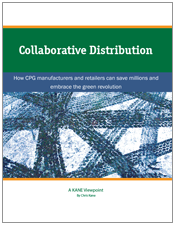 A free white paper by Kane Is Able explains how Collaborative Distribution could be the next major advance in supply chain management.